Everything happens for a reason! I came to meet Kathleen and Eddie because another NJ Wedding Photographer that they contacted was unable to work their wedding date. That photographer and I are in the same South Jersey Photography community. One thing led to another and I was referred to this lovely couple. They contacted me, we set up a Skpe meeting and they became excited over my work and my approach to Wedding Photography. I came to love them right away as I could tell how important they were to one another ( and how much they loved their cat ). They had been a part of each other's lives for almost a decade. Their wedding day was a long time coming! After a few months of getting to know them, I met Kathleen and Eddie at Longwood Gardens for their engagement session. I couldn't help but notice how Eddie always looked at Kathleen with so much love in his eyes. Every girl wants to be looked at the way he does Kathleen. This man simply adores her in every way! 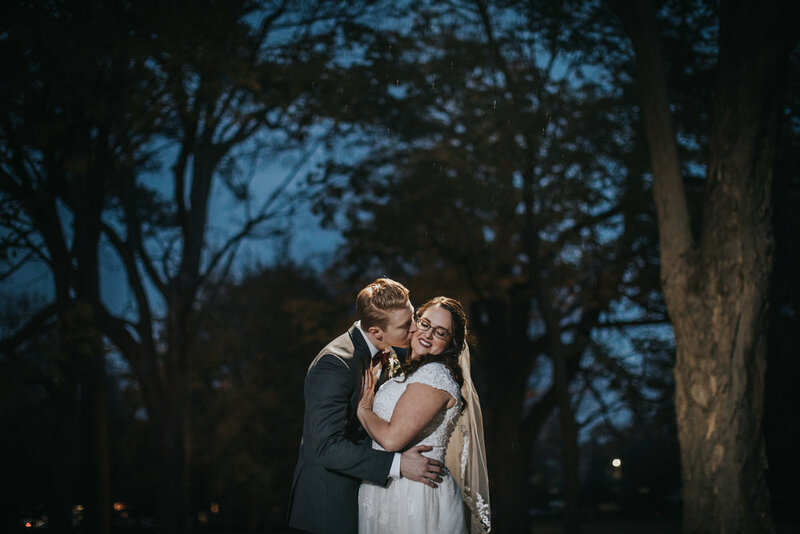 I was very much looking forward to Kathleen and Eddie's Fall Fisher's Tudor House wedding to capture more of this connection for them. As I am sure my brides do the week of their wedding, I was checking the forecast for November 18th often. It looked as if, more than likely there would be rain on Kathleen and Eddie's wedding day. Isn't this good luck? I made sure to bring a clear umbrella, as I had a feeling we would need it for portraits! The rain held off for most of the morning. 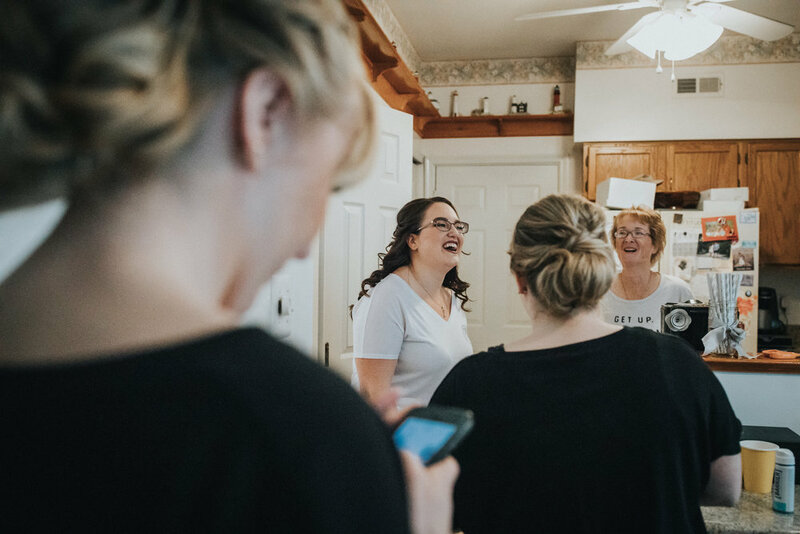 I was with the bridesmaids at Kathleen's childhood home in Burlington NJ as my second photographer, James was with the groom and his groomsmen at the Hampton Inn documenting Eddie's anticipation. Eddie's brother was an attentive best man, doing his part to make sure Eddie was ready and on time. As the girls finished their hair and make up, I began taking photos of her lovely details: dress, shoes, veil, invitation, jewelry. I realized that there was such a calm in the air. The new trend recently seems to be that bridesmaids wear coordinating floral robes for getting ready. It is so pretty and right up my alley with the lace and colorful flowers...but I was really into Kathleen's girls having matching monogramed T-shirts and rocking comfy sweatpants! I almost asked if I could be a bridesmaid. After popping a bottle of Champagne (and the cork landing on my head), a toast and laughs Kathleen was ready to get dressed and have her first look with her father. Before she knew it, the next move was out the door and to the Church! 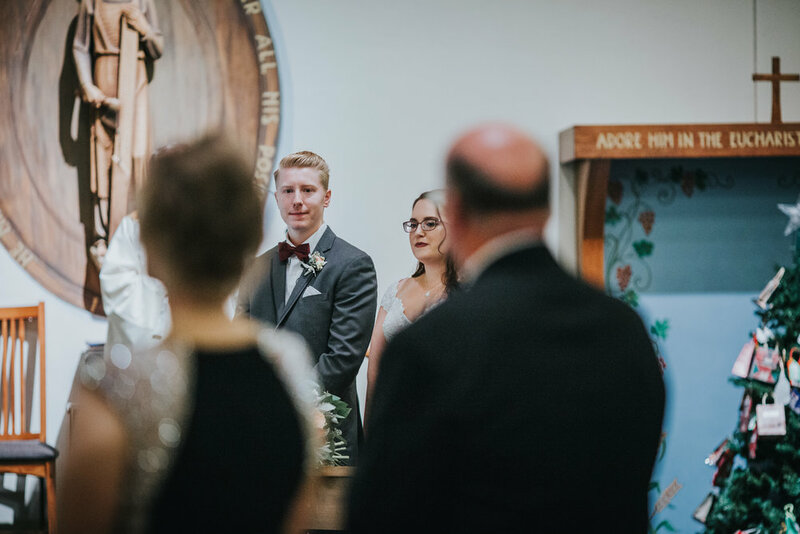 No First look for these two - they wanted to honor the tradition of seeing one another for the first time during their wedding ceremony at St. Elizabeth Ann Seton Rectory in Bensalem, PA. Again, Eddie was beaming with love for Kathleen and it was contagious. Their ceremony was very special and meaningful to not only the two of them, but their family members also. As soon as they left the church as Husband and Wife, the first raindrop landed! A little bit of rain didn't stop this bridal party from supporting and having some fun with the newlyweds. They say we are lucky if we have one true friend in this world. Kathleen and Eddie not only have the luck of a rainy wedding day, but fortunate to have such awesome people in their corner! The muted daylight quickly ran away from us, and the rain fell heavier. The bridal party took cover in the limo bus as the brave bride and groom humored me for a few portraits. We finished up with their romantic photos indoors at their Fisher's Tudor House wedding venue. The gorgeous decor with coffered ceilings, grand staircase and elegant chandelier lighting allowed me to utilize the elements in the space for creative portraits. I always look for a way to frame my subjects to draw attention directly to them. 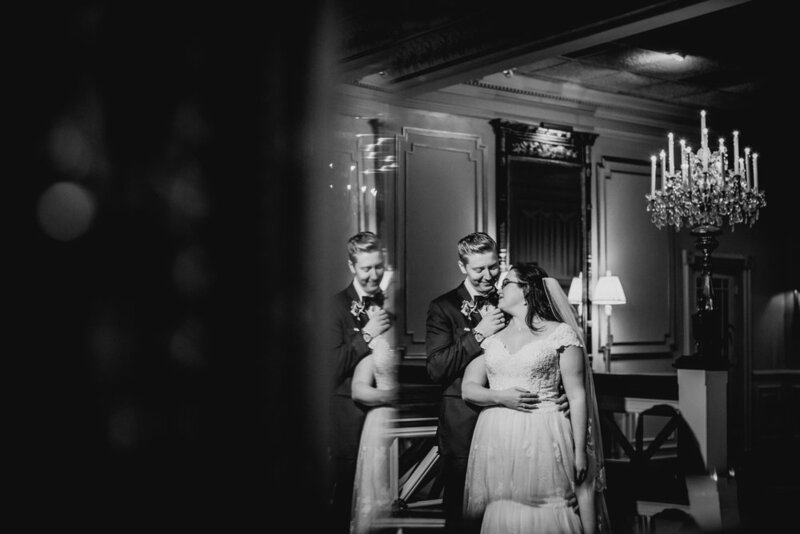 Having an in-love couple laughing and flirting also helps for making a memorable image! When I am done with the directive part of the day, I tell my couples that the "hard" fun part is over, and now the "easy" fun part begins! 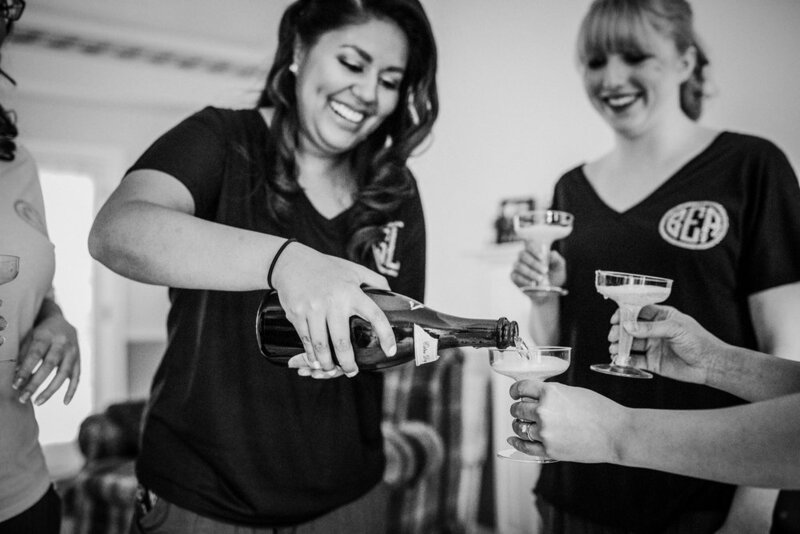 Their job during the reception is to dance, eat, laugh and make memories. My job is to capture the memories. 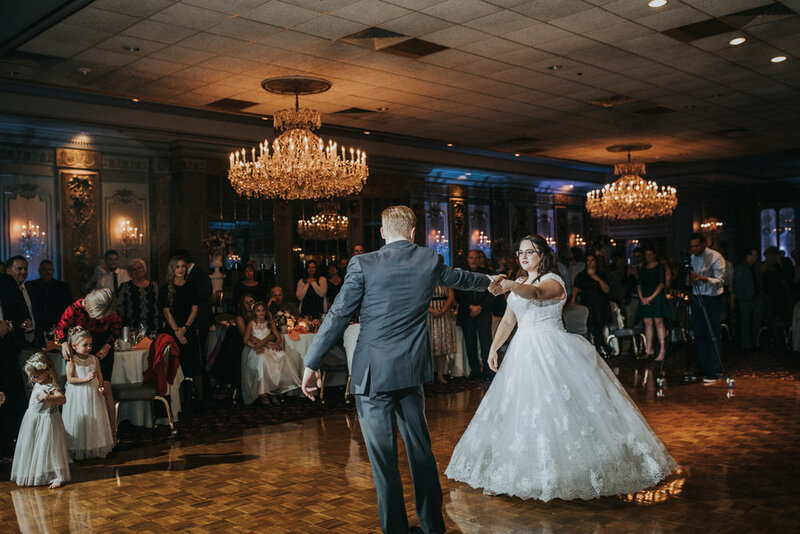 The Fisher's Tudor House Versailles Ballroom was a massive 7,000 square foot room, large enough to accommodate endless foolish dancing by all guests! What a fun crowd! I enjoy working at a venue I haven't been to before. Something about laying eyes on a new environment for the first time sends inspiration my way to do my job in a creative, authentic fashion. 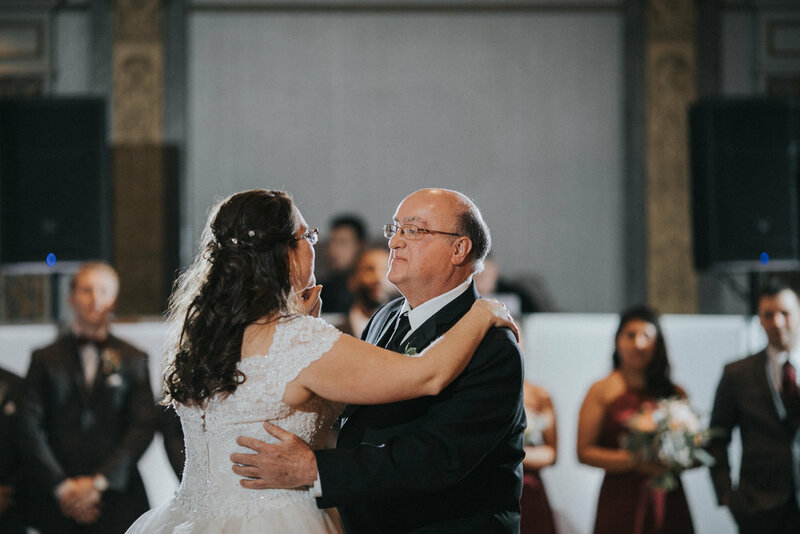 I was honored to have been Kathleen and Eddie's actual second choice for their wedding photographer as now we have not only made new memories together, but have become friends! See? Everything happens for a reason! Congratulations Mr and Mrs Eifert! 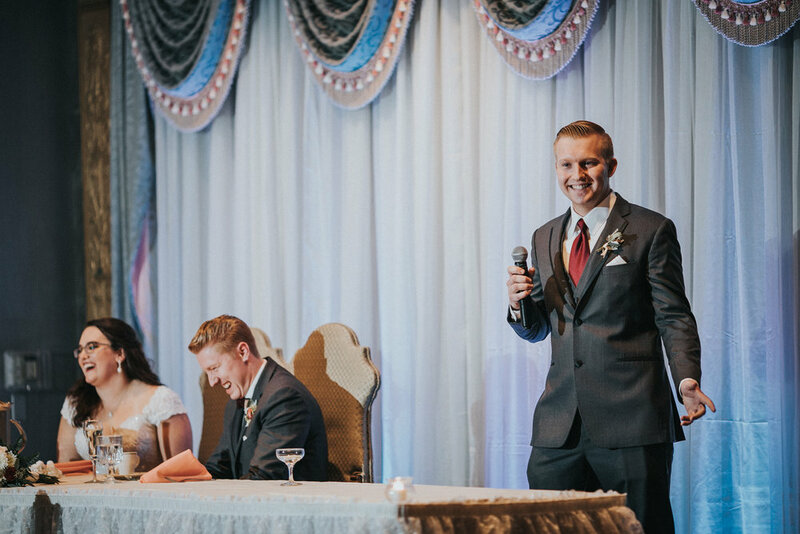 Thank you for having me be a part of your special day. I wish you many happy years together, and may you always keep one another laughing!